Real Vision is a video-on-demand platform for finance where investors can learn about macro-level trends and develop actionable trade ideas. Real Vision came to us for a recommendation on how to improve their platform, as their internal team was in the process of redesigning their website and developing a mobile app. We started off with a site audit and user testing of the existing platform to establish an objective, shared knowledge of what the was working and what wasn’t. Real Vision’s competition is primarily traditional newsletters and research publications. Without direct competition in the same space, we looked at other video experiences like Hulu and Netflix to see what inspiration we could draw from their platforms. We surveyed Real Vision’s existing users to uncover demographic and behavioral information. Surprisingly, we found that the majority of users were using Real Vision to help shape their personal investing strategy, not for business. After analyzing the survey results, I began interviewing users from a sample that was representative of the various occupations, ages and behaviors of our users. The deeper I got into interviewing, my assumption to segment users based off how frequently they used the platform was confirmed. We provided Real Vision with two personas that were representative of the needs and behaviors their users. Users found it challenging to navigate the existing IA of the website, so we started exploring the navigation structure of the video content with a card sorting exercise. This grid shows the distribution of cards across the categories defined by users. Each table cell shows the number of times a card was sorted into the corresponding standardized category. Users categorized videos into a variety of different “buckets”. Some approached the task thinking about the content (i.e. China) some the speaker, some the delivery (i.e. Investing Psychology). We found that users thought about categorizing videos in many different ways. Some organized videos by topic, some by delivery, some by speaker. We recommended a new design that included filtering options on different levels, as well as tagging, to aid in content navigation. Real Vision’s design team was able to take the insights and recommendations we delivered and apply them to the redesign, which is currently in development. Kickoff is a social dating app that introduces you to friends of friends. Kickoff focuses on quality introductions, not quantity. Kickoff’s current design only allows users to create profiles as individuals to match and chat with others. In the current design there isn’t a way for users to meet people in a group setting. I designed a new feature for Kickoff that allows users to create groups with two other friends and chat with other groups after getting a mutual match. This video shows how we would introduce the new feature into a user’s daily “batch” of matches. A notification and a group match would appear, with a prompt to create a group so you can match with friends. In my competitive analysis, I found very few apps that had this type of feature. Out of the few that had a similar feature, they had confusing interfaces and poor feedback to a user actions within the system. To explore the 4 different scenarios (a New User vs Existing User, and being invited to a group or creating a group and inviting friends) of someone using this feature I started sketching out user flows and thinking about the different parts of the interface that each type of user would need to interact with. After sketching out key screens, I brought my designs into Illustrator for a first round of low-fidelity wireframes. For this project I delivered a final screen flow and technical document outlining interactions and edge cases that was to be passed off for development. Lucky Charms receives countless calls, emails, tweets and Facebook posts from marshmallow-obsessed fans longing for a box filled with only marshmallows. What if Lucky Charms made their dreams come true with a limited-edition marshmallow only box? We designed a campaign that delighted and entertained Lucky Charms fans and encouraged them to share their love for the magically-delicious cereal. My role was creating a user journey for the overall experience to help communicate the idea to the client. To enter, fans shared a photo of themselves holding an imaginary box of Lucky Charms on Facebook, Twitter or Instagram with the hashtag #Lucky10Sweepstakes. Lucky Charms responded to all entries with custom GIFs, and the “Lucky 10” received limited-edition boxes of Lucky Charms Marshmallows Only cereal! One of my first projects while a student at General Assembly was creating an e-commerce holiday microsite. I was given a local sporting goods shop as a brand to design for, and created a digital experience that enables holiday shoppers to quickly view a selection of products based off their relationship with the person they are buying for. Privately owned since 1908, Paragon Sports has been the benchmark of quality for all types of sporting equipment and gear. They take pride in showcasing products from brands you know and love as well as unique brands that you may not be familiar with yet. Their mission is to provide a unique and fulfilling shopping experience to every customer, every time, by setting the standard in customer service and quality product. With a curated gifting experience featuring a collection of 100 hand-selected products, Paragon can bring its in-store personality to a broader audience. I focused on adapting the unique in-store experience of shopping at Paragon in this microsite. Shoppers will be guided through the site as if they were shopping with an expert from Paragon’s staff. This year 43% of holiday gift spending will happen online. Smaller retailers like Paragon need creative digital strategies to compete against large e-commerce companies during the holidays. Without any differentiating factors, Paragon’s existing site doesn’t stand out from the competition, and my goal was to create a unique shopping experience to leverage the competitive edge that Paragon has (but fails to communicate digitally). For this project, we were given three personas to design for. I chose “John” as my primary user, and worked through flows and scenarios in which he was shopping for his young daughter. Starting with sketching and low-fidelity wireframes, I tested and refined the initial designs based off user feedback from testing sessions with classmates. I created a low-fidelity protoype with Omnigraffle + Invision. View it here! The deliverable for the project was the low-fidelity mockup, but since then I’ve been playing with a responsive design using Hype. I’m familiar with Axure and InVision, but Hype is new to me and it’s been fun to play around with the beta version. 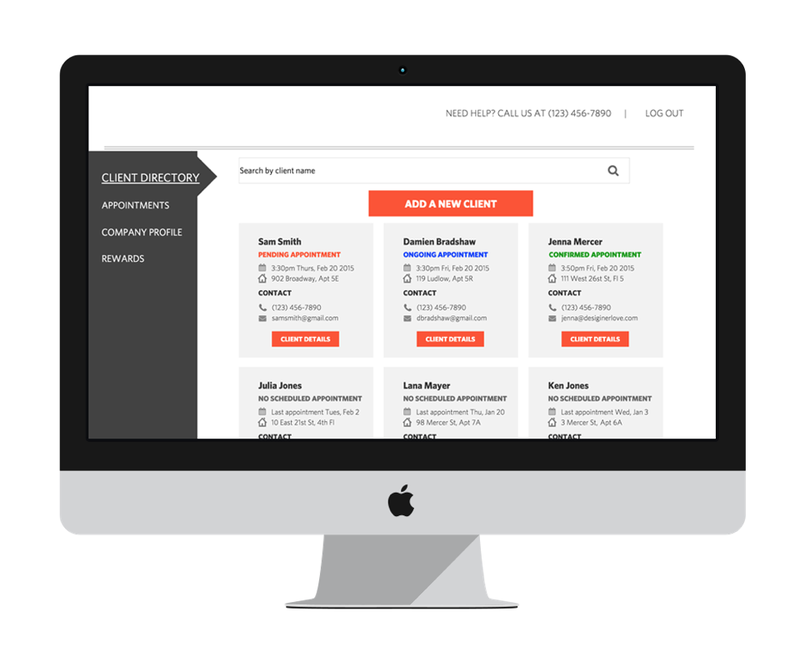 Client is a health and wellness service provider that works with massage therapists to deliver on-demand massage services to clients around the country. Currently, concierges are booking massages for their clients without a good way to manage payment options or clients’ personal details. We designed an easy-to-use dashboard that streamlines the process for concierges, making booking and paying for clients’ appointments easy and intuitive. We started by reaching out to concierges in our client’s network who were already using the serivce, as well as concierges who had never used the service before, to gather data from a variety of perspectives. Through extensive interviews we identified trends in the behavior and needs of our users, and found two main types of concierges, Personal and Hotel. Our research showed us that the primary user of this booking feature would be the Personal Concierge. We found two main types of concierges, and our research showed us that the primary user of this booking feature would be the Personal Concierge. 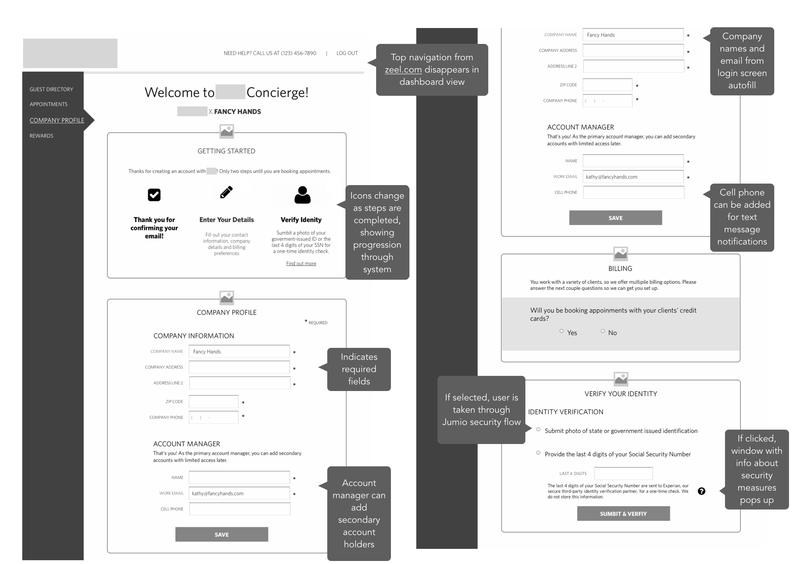 From our interviews with distilled the trends we saw into personas that represented our concierges, and started working thorough flows and scenarios to get a better understanding of how they would use the product. To maximize unique perspectives of our stakeholders, we presented the team with a user flow and had them sketch key screens of how they imagined the system. 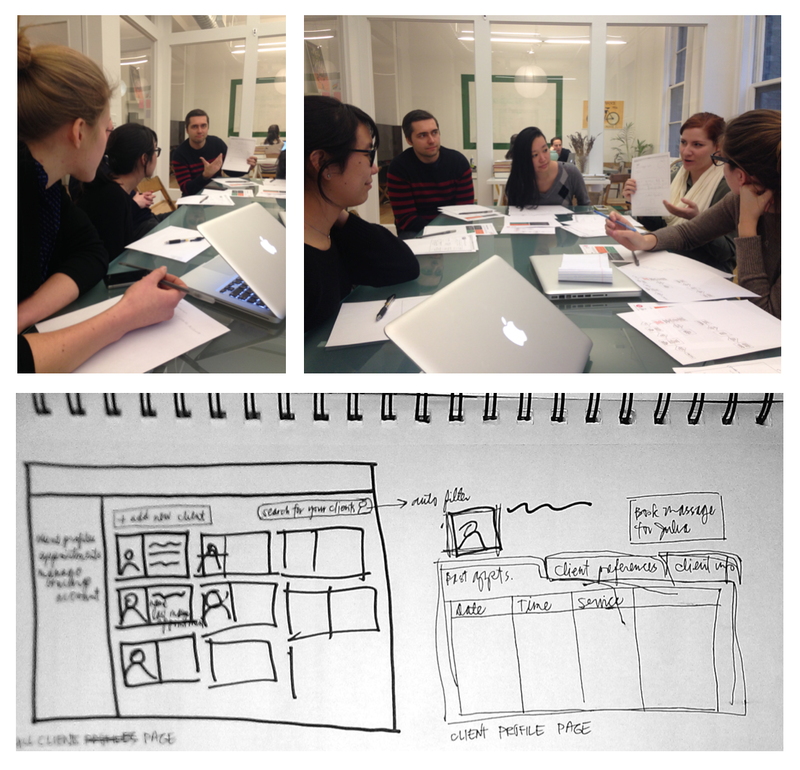 We started by sketching our initial ideas, we did a first round of wireframes and tested them with users. After refining our designs through several rounds of testing, we came up with a final interactive prototypes for our client. People use Yelp to find all sorts of things—especially when they’re on vacation and in an unfamiliar place. Yelp wants to expand their mobile offerings to be the go-to place for travelers planning their trips. We designed a feature that seamlessly integrates into Yelp’s current app that allows users to create itineraries with designated locations and destinations and share them with friends. From our screener survey we carefully selected a number of respondents that represented a range of potential users with differing backgrounds and interviewed them about their habits, behaviors, pain points and what delights them when they are traveling or planning a trip. We conducted competitive and comparative research, specifically looking at what Trip Advisor had to offer, as it was a commonly cited source from our initial survey. Trip Advisor caters to the more “robust” traveller, one who likes to plan out every every detail, from flights to tours. 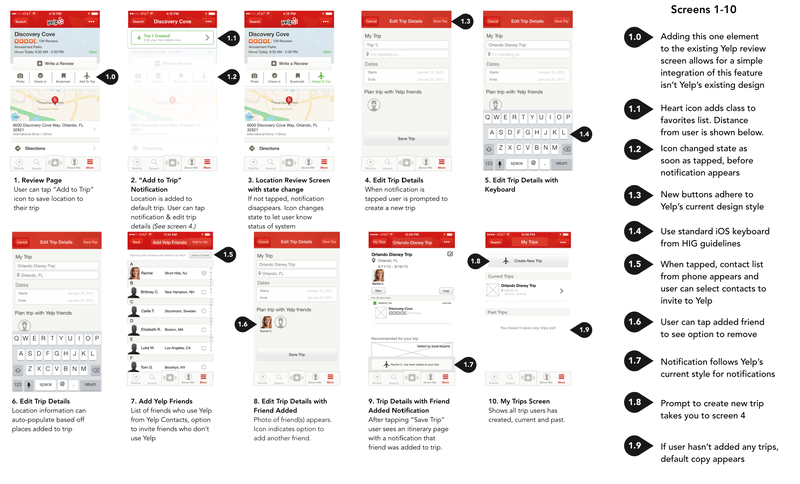 We wanted to create a travel feature for Yelp that doesn’t overwhelm the curious, flexible traveller. Yelp’s current “Lists” feature is only available on the website, not the mobile app, and only lets users add places they have reviewed to each list. Although Bookmarks are heavily used on Yelp, there are only 3 filtering options, they are buried under “more” in the app, and map view isn’t filtered. From our interviews we distilled the needs and behaviors we identified into three personas, our primary persona being “Luke” (below). We started exploring the feature with user flows that gave an idea of how our user would interact with the system. Busy professionals have trouble finding and signing up for quality fitness classes that are near their home or work, and need information about classes and payment all in one place. Om Finder 2.0 helps users find, book and pay for fitness classes nearby, discover new instructors, and get rewarded for all the hard work. Our initial survey was designed to explore workout habits, class attendance, incentives to exercise and general needs when trying to stay active. By hearing real life experiences about users’ workout habits we identified behavioral trends and current issues that users face when scheduling workouts on-the-go. Om Finder is a free app is designed to help iOS users locate yoga studios, classes, and instructors in Canada, the U.S., and around the world. Data is sourced through an API provided by Mindbody, but class and instructor information isn’t up to date. We also looked at other similar products, what they did well, and what we wanted to improve on. We found extensive but overwhelming class offerings which make quality class discovery difficult, and a lack of incentive to actually use the site/app to discover or book classes. With the three personas we developed after our interviews, we started identifying features. We ranked them from essential to “nice to have” for the user, and then from low to high design and technical effort. Using the prioritized list of features and insights from interviews we refined the core functions needed for our minimum viable product. To rapidly explore ideas for initial designs, my favorite tools are a Sharpie and my notebook! Before starting digital wireframes, we explored what the screens could look like on paper. After sketching flows and exploring our initial ideas, we created wireframes and tested them with users to validate our designs. 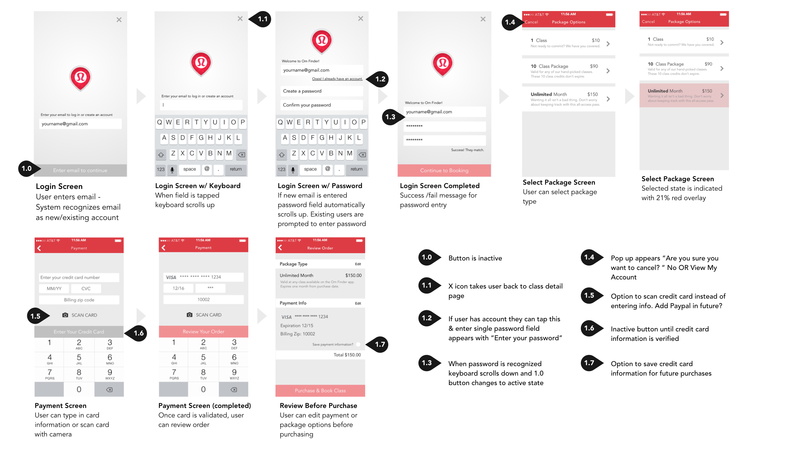 Annotated screen flow for sign in and checkout flow. This project was completed as a design challenge in an 8-hour time constraint. In this day and age, there are so many ways to spend money; in many cases, too much money. 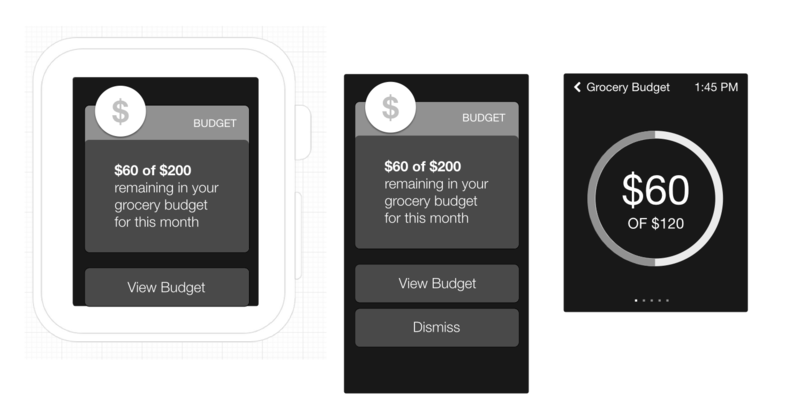 Design a digital experience that would help a person keep track of how much they’re spending as well as help them save money. Millennials find it challenging to save money and stick to a budgets. They don’t know where to turn for solid financial advice and many are concerned about how debt is going to affect their future lives. 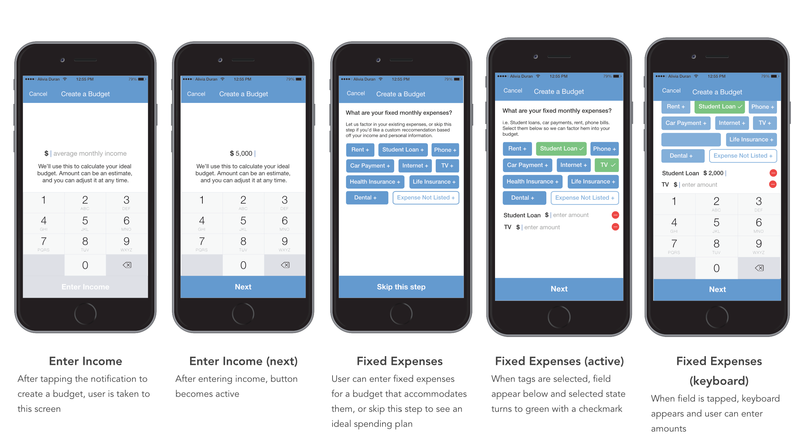 This budgeting app aims to help millennials take control of their finances by providing an all-in-one platform to track spending, set budgets and get advice on spending and saving habits. Millennials are saving earlier, but admit to not saving enough. Financial security is valued, and two-thirds have established a monthly budget they try to follow. Over a third use a digital budgeting system. To understand what resources are currently available to people looking to take control of their financial lives, I did a competitive analysis of other digital products that are available to consumers, looking specifically at what they did well and what users’ feedback on the experience was. 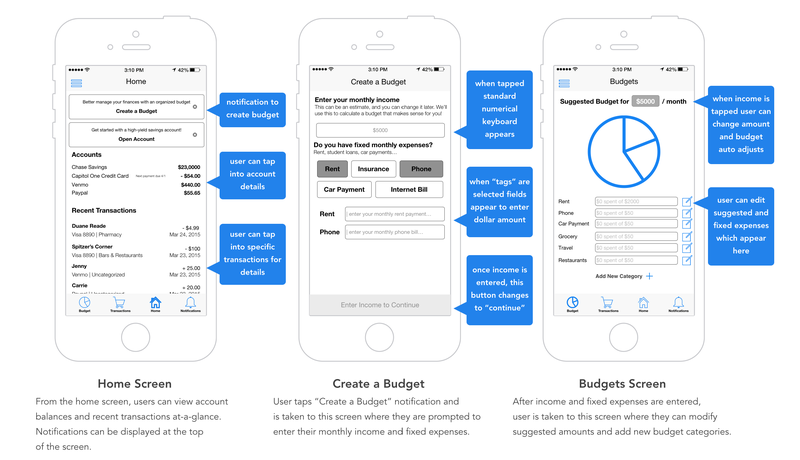 Mint offers a consistent experience across devices and uses data visualizations that make understanding your finances easier. They offer tips based on your spending and saving behavior and guide users through the system in an intuitive way. 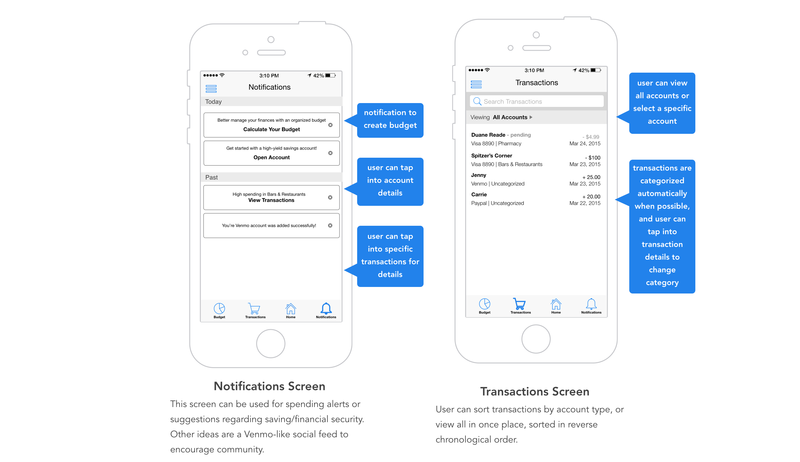 With Pocket Expense, users’ accounts aren’t automatically added. The user has to manually set up budgets are there are no defaults or guidance for users who may be setting up a budget for the first time. Calendar feature provides a good overview, but can be hard to interpret. Mvelopes offers a good on-boarding process that addresses customers’ goals/concerns, but has an inconsistent experience across devices. Website feels outdated with a cluttered interface. There are no reminders of privacy when adding bank/credit card accounts. To better understand how this product could be used I started by brainstorming with an affinity map, then started sketching user journeys and writing scenarios. James, a recent graduate of NYU working in journalism, recently downloaded the app. He has already linked his savings account and credit cards to the app. He sees his spending habits are a bit sporadic, and wants to start managing his money more responsibly. He gets a notification that he can create a budget on the app and decides to see how the app can help him. James now has his budget in place, and is grocery shopping. He usually orders from Seamless, but wants to start cutting back on his take-out budget and is at Fairway getting some fresh produce for the week. He gets a notification on his Apple Watch reminding him of how much money he has left in his monthly grocery budget. In the 8-hour timeframe of the project, of course there wasn’t time to explore the entire scope of what a product like this could look like, but these are a few areas I think would be good next steps in the designs. A concern of many, debt can be overwhelming. I’d like to explore how to help the user create a plan of how to save enough to get out of debt and visualize where they are and where they could be. For this challenge I focused on the budgeting aspect. I’d like to add a feature that allows users to create and track savings goals that are linked to their accounts. I chose to design for mobile iOS because it is commonly used by the primary demographic and for on-the-go access. I’d like to work on a desktop site and android version next.